You thought having great wealth made you a great man. What's firm and lasting is man's nature, not his wealth. And, flowering a brief season, soon flies out of doors. From Medea and Other Plays by Euripides, trans. Philip Vellacott, Penguin Classics, first published in 1963. And now for a quick update on softball. 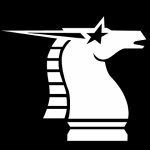 After three weeks of play, my Knights are 1-1. We beat the Beavers, lost to the Spirits, and suffered one rain out. I started a bit slowly. In my first game I went 1-3 with an RBI and a Run scored. I started the game at DH, but moved to Short Stop for the last three innings, where I made a couple of plays. In the second game, I did better, going 3-5 with 3 Runs scored. I also pitched a complete game, making several plays, and, most importantly, giving up no walks. We lost, but it was tight. For the last couple of days, I’ve been constructing a new Space Hulk. After a lot of deliberation, I decided I didn’t want to invest a lot of money in it. So, I printed out some floor tiles from the old Guncrawl game, mounted them on foam board, and gave each tile a 15mm wall. I wanted to give the impression of a wall, but I didn’t want the walls to get in the way of actually moving miniatures. Using a modified version of the Starship Troopers rules, I set out to see how many of the poor humans would escape the Dalek attack. In a real surprise, one member of the 109th managed a lucky shot on the first turn, blasting a Dalek to pieces and drawing first blood. However, from there things didn’t go so well. 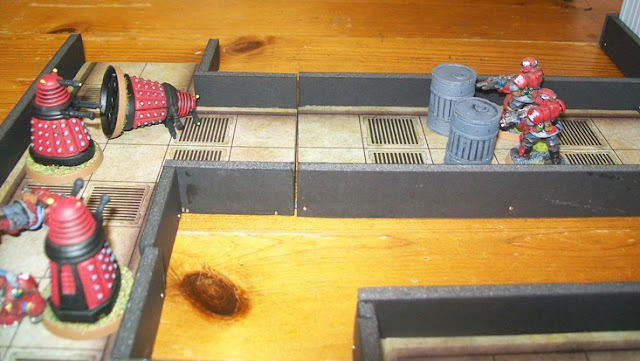 The main Dalek assault crashed through the first barricade with little difficulty. 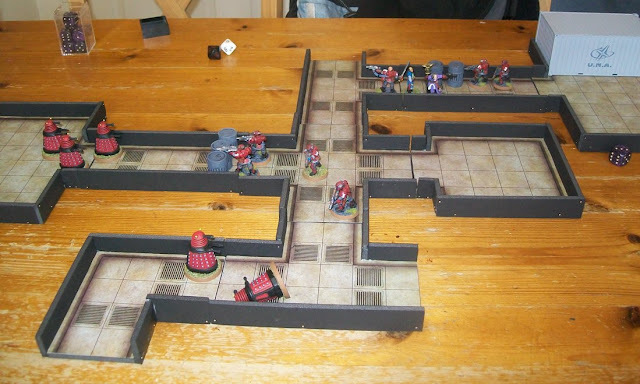 Although the troopers fell back, they were caught in a crossfire in the corridor behind. Three troopers fell to the Dalek death rays. But their sacrifice had bought enough time for the General to reach the transporter and beam down to the planet. 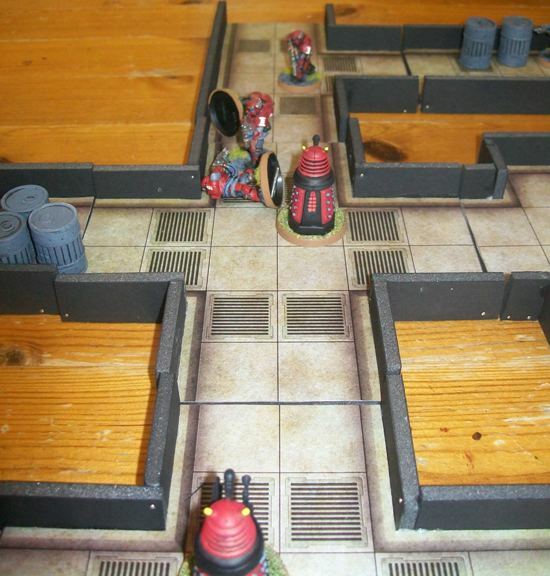 As the Daleks rounded the corner to the cargo hold, they came up against the trooper's last line of defence. Here a second Dalek finally fell to concentrated laser fire. 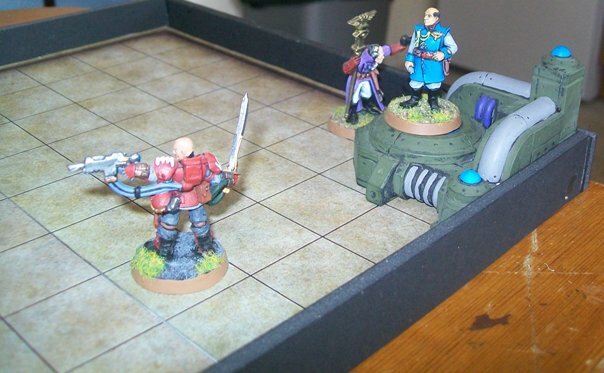 After the squad psyker also beamed to safety, the sergeant ordered his mean to fall back. One trooper made it to the transporter, and beamed to safety, but two more fell to Dalek fire. 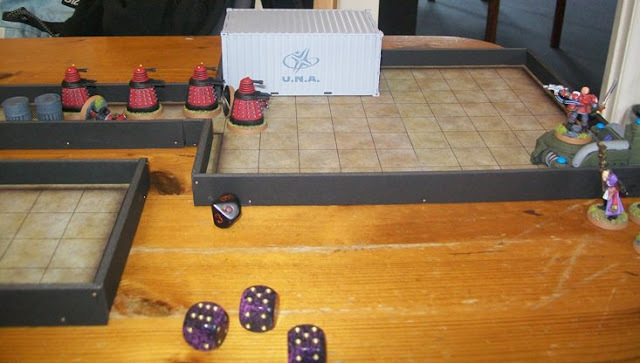 The game ended with the sergeant, the only man left alive on the ship, jumping onto the transporter pad and exchanging fire with the Dalek’s as he transported out. Although five troopers had fallen during the defense of the ship, they had allowed the General, and three other’s to beam to safety. They had also taken out two Daleks during the fight. Down on the planet, the General sends out a distress call, but will any help arrive before the Dalek’s land? For awhile now, I’ve been researching the miniature market, trying to find figures to construct a kind of generic science-fiction force. After a lot of consideration, I’ve finely done a bit of painting, and can present the first couple of figures for my new United Earth Defence Force. Despite wanting to include some big battle robot models, I wanted the force to have an old-school science fiction look, the kind of hard-edged, chunky science-fiction from the seventies and eighties. 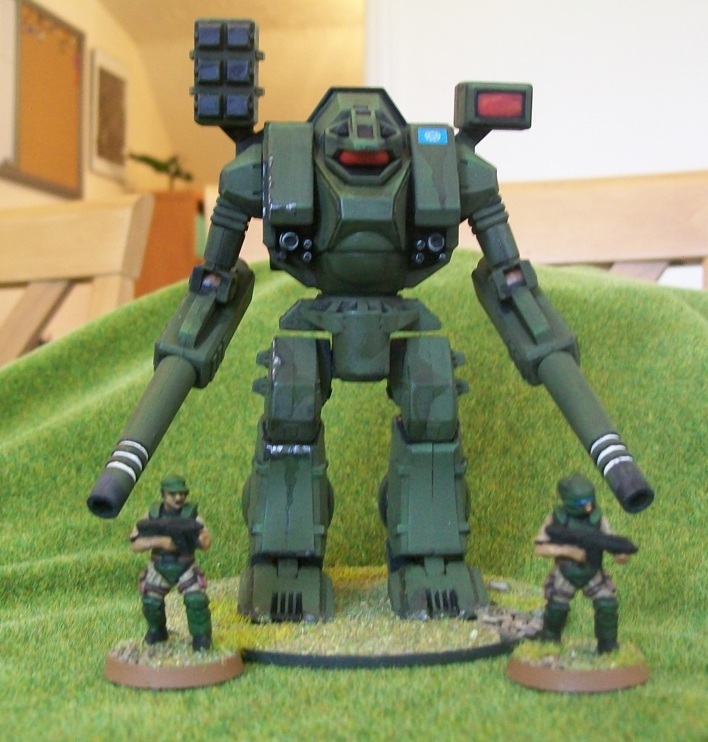 The big guy here is a Robotech model, which I ordered from Hobby Link Japan. 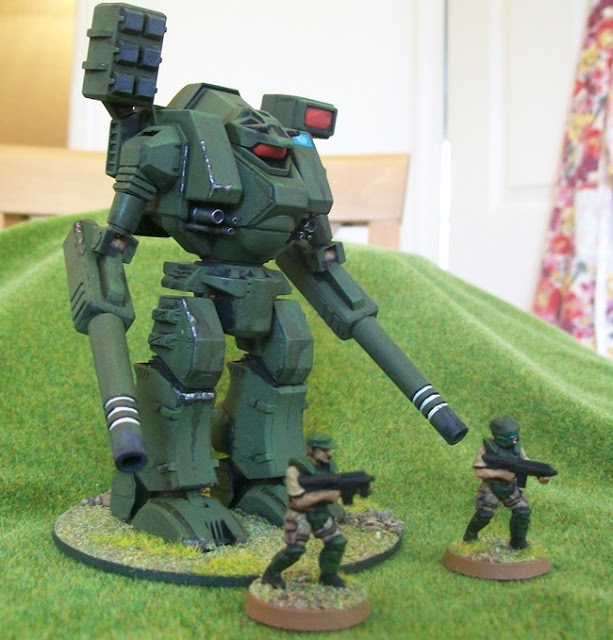 It only cost about £5, wasn’t too difficult to assemble, and is just tough enough that I have no fear in using it as a wargaming piece. I tried to paint it with a grubby, battle worn appearance. This is the first time I’ve attempt to paint scarred metal – that is edges where the paint has scrapped away, leaving bare metal underneath. I still need some practice on this, but it came out pretty well. I also splattered black wash randomly over the model, to give it the dirty, low-tech kind of look I'm going for. I figure it is actually a mech, with a single pilot inside. 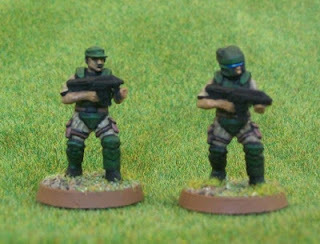 The two soldiers are marines from Defiance Games. I’ve got a bit of a love-hate relationship going on with these figures. I love the ascetic of these figs, which seems to be drawn from the film Aliens. 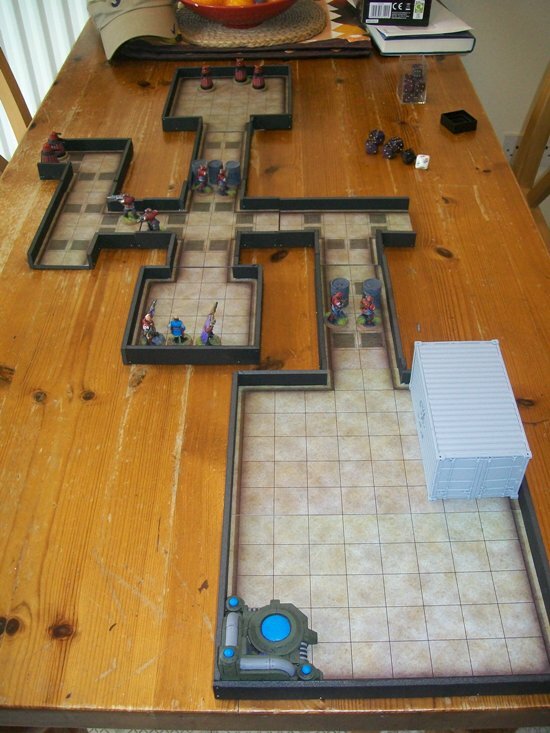 They are simple, uncomplicated plastic figures that weren’t too difficult to assemble. On the flip side, the detailing on them is very soft, by which I mean that the edges on the detail tend to be rounded and flow into the main body of the figure. This makes it hard to pick out the details, especially for someone like me, who likes to use black-lining between figure elements. The other issue is that there really are a very limited number of different figure poses you can make without doing some difficult conversions or bringing in pieces from other sets. All of that said, looks wise, they were exactly what I was seeking, and I plan on painting a full platoon at some point. I think I might repaint the soldier’s visor read to match the mech. And now for something rather silly. Responding to a challenge set by my friend Phil, I present the starting line-up for the Greeks in their big show-down versus Troy. 1. Little Ajax (CF). A true speedster, Ajax can cover a lot of ground in center. That same speed should also lead to a high on-base percentage. A tad on the arrogant side, his mouth could get him in real trouble one day. 2. Diomedes (3B). Despite his youth, Diomedes is already a veteran. His skill and in-game smarts make him the perfect number two-hitter, who can be counted on to hit the ball to the right side to advance a runner or lay down a bunt when necessary. Also, his calm demeanour should prove an asset while playing the hot corner. This guy has a very bright future. 4. Big Ajax (1B). A classic clean-up hitter, Ajax swings a big hammer. His towering defence should prove a real asset at first base. 5. 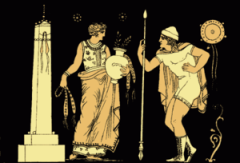 Agamemnon (RF). Despite his poor decision-making, which often leads to high strike-out totals, there is no doubting Agamemnon’s power. Off-the-field issues could prove his downfall. 6. Nestor (2B). A wily old veteran, Nestor brings a huge amount of experience to the team. This guy has seemingly played for every one (including the legendary Argonauts travelling team). While he no longer swings the lumber like he used to, he’s still a solid player on both sides of the ball. 7. Menelaus (LF). 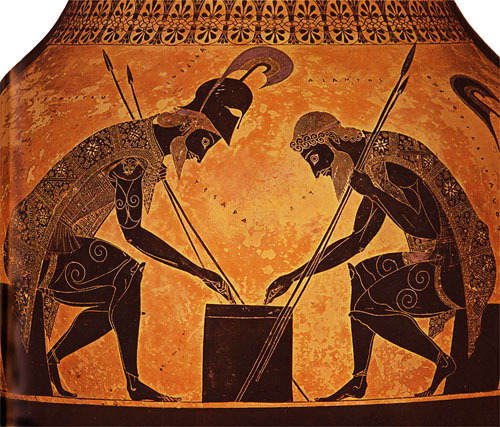 While lacking the pure power of his bother, Agamemnon, Menelaus is no slouch in a one-on-one match-up. However, his marriage could prove a distraction. 8. Odysseus (C). Although considering retirement, Odysseus can still play the game. With his cunning and tactical awareness, he’s the perfect guy to be calling the pitches. He seems to have a knack for knowing exactly when to call for a curve-ball or change-up. 9. Antilochus (SS). The son of Nestor, Antilochus combines good speed with great hands. Just the sort of guy you want out at short. Still young, his swing should develop in time. Patroclus (P). When Achilles leaves the game, there really is only one guy who can ‘don the armor’. Although lacking Achilles god-given talents, he’s a man the Greeks will follow. * In fact, Achilles career will be tragically cut short after failed Tommy John’s surgery. After three full days in Meteora, we decided it was time to move on. There were a few paths we hadn’t explored, a cave we hadn’t visited, but we both felt that to stay any longer would have suffered from diminishing returns. Also, Steph was keen to have a full day in the northern city of Thessaloniki, from which we were schedule to fly home. Upon arriving in Meteora, we had been delighted to discover that there was a direct train from the town to Thessaloniki once a day. So on a cool, clear morning, we left our friendly guest house, carrying our bags and followed by an overly friend dog, and walked down to the train station. The train rolled in exactly on time, covered in the customary graffiti. Inside, the train was old and worn, but not uncomfortable. We had assigned seats, but there were very few passengers. The journey lasted nearly four hours, but passed by quickly enough. As usual, I spent a majority of the journey staring out of windows, watching the country flow by. We knew the train would be passing near mount Olympus and hoped for a good view of the peaks, but by the time we rolled by, the clouds and mist had closed in and there was very little to see. In truth, the entire journey afforded very little to see - lots of little towns, too small or lacking in tourist interest to even make it into our guidebooks. The second half of the journey hugged the eastern coastline of Greece, so we did get some nice views out toward the sea, but the land seemed dry and undeveloped. Our only regret on that journey was that we hadn’t packed enough food and water, as neither was available on the train. By the time we pulled into Thessaloniki, we were so hungry that we stopped to eat in the train station, at a fast-food chain called ‘Goodies’. It wasn’t the worse fast food ever. After the peace of Delphi and Meteora, it was a bit shocking to step out onto the crowded and noisy streets. Thessaloniki is a large and sprawling city. At first glance it appeared ugly and intimidating. After taking a moment to get our bearings, we set off into the heart of the city, carrying our bags, and hoping it wasn’t too far to our hotel. Well, we got a bit lost, but we found it in the end. Our hotel, which had been chosen based on its cost (cheap) and its central location, was an interesting building. I suppose it was once a grand old Victorian style hotel, as it appeared to have been constructed for giants. The doors were at least nine feet tall, and the ceilings at least fifteen and possibly more. The bathroom in our room was obviously a later addition. The view from our window looked out onto a messy collection of the backs of other buildings, most with balconies crowded with junk. Still, it was cheap, not uncomfortable, and came with a half-hearted breakfast, which was still better than nothing. After dumping our stuff, we set off for the waterfront, hoping a bit of sea air would help blow away the stiffness of travel. Thessaloniki’s sea front is a long curved harbour, paved all the way around. It begins at the actual shipping harbour, and runs around until it reaches the White Tower, an old medieval tower, and the city’s most recognizable landmark. The walk is pleasant enough, although the road that runs next to it is always busy, and just on the other side of the road is a nearly endless stretch of bars and restaurants that are busy during the day and overflowing at night. For me, Thessaloniki’s only real attraction was its archaeology museum, which is top-notch. Rightly famous for the huge amount of golden treasuries from Macedonia, it also contains a nice collection of other artifacts from Ancient Greece and Rome. My wife was also interested in seeing the city’s small, Jewish museum. The Jews have a long, varied, and interesting history and association with the city, and, despite its small size, the museum does a very good job of presenting it. (Once again, they could make it a little easier to find!). Between the museums, and a lot of sitting in the shade by the white tower, gazing out at the sea, we managed to fill the rest of the day. On our last full day in Greece, we decided to walk up the city, following the old Roman walls, to explore the ‘Old Turkish Quarter’ and just see what we could see. On the way, we stopped by the church of St. Dimitris, notable for two reasons. First, it contains the relics of St. Dimitris, patron saint of the city, and this is still a big, important draw. Of more interest to me was the large crypt, much of which is open to the public. Although it is empty now, save a few broken pieces from long lost tombs, it was fun to wander amongst the dim, echoing chambers. As we left the church and started up the hill, we soon realized that the day was one of the hottest we’d experienced in Greece. Luckily, since we had no particular schedule or time-table, we were able to stop whenever we wished for a sit and a drink. We stopped for one particular drink at a cafe that sat on a ledge above most of the city, and from which you could look down over the rooftops and out over the sea. As I was staring out, sipping my coke, I spotted an odd looking bit of cloud. As I looked closer, I realized it wasn’t a cloud, but the snow-capped peaks of a distant mountain. The actual body of the mountain had faded to a deep blue which had sunk into the sky and ocean around it. I pointed this out to Steph, and she realized that it must be Mount Olympus. Wow, suddenly it all seemed to make sense. There was the top of the mountain, seemingly floating in the sky, like...well, like the heavens, I guess. It was a magical little moment for me. At one point, Thessaloniki had a pretty extensive set of Roman walls (later added to and improved in the Byzantine era) and a good chunk of these walls still stand. We wandered around these for a bit, taking in the views. At one point a Greek woman came by, shook her head at us, and then showed us where to get the really good view by ducking through a hole in a fence. From there, we wandered around the Old Turkish quarter, which, in truth, didn’t seem either old, or particularly Turkish. Then we headed back down to the main section of town. We passed by the giant ‘Rotunda’, and extremely impressive building, originally built by the Roman Emperor for an unknown purpose, then made into a church of St. George, then into a Mosque, then back to a church. Now, it sits completely empty, except for scaffolding. You can wander in – it is strange being in such a huge building with nothing in it. The Greeks don’t seem quite sure what to do with the building now, and probably wouldn’t have the money if they did, so there it stands for the moment. We also stopped for a break at one of Thessaloniki’s famous sweet shops and ordered a small selection of unknown pastries. Now, I’m a man who likes his sugar, but one bite of most of these little morsels was all I could stand. To simulate the experience at home, go to your kitchen cupboard, get a jar of honey, and drink it. Sprinkle in a few nuts if you are so inclined. Unsurprisingly, Steph loved them. We had dinner late that evening, although we were still only just finishing as most of the Greeks were coming in. As we walked out of the restaurant in the cool and dark of the night, the whole city of Thessaloniki seemed to make more sense. In the dark, most of the ugly graffiti was lost, and the streets were alive with hordes of people. Thessaloniki is a University town, and it appeared that all of the young men and women that had seemed absent in much of the rest of Greece, were here. Nor did this crowd seem to be worried about the economy; they were here to have a good time. Well, it was good to see, but for Steph and I, our good time was coming to a close. We took a slow walk back to our hotel, in no real hurry, but with nothing much left to do. The next morning, we paid our bill early and caught a taxi to the airport, which is some ways out of town. As it turned out, we arrived so early, that British Airways hadn’t even set up their check-in booth yet. Time passed, as it always does, and eventually we were on our plane, flying back to England. My wife and I have a joke that is probably shared by many who live in Britain: ‘How do you know when you’re home? It’s raining’. Although we loved our Greece Adventure, I think, more than any of our other trips, we were happy to arrive home. While it is often cold and wet, England is a beautiful country. It was nice to get home to where the air is fresh and clear, the land is green and alive, and the graffiti is kept to a minimum.